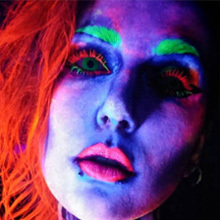 With ColourVue Glow Green contact lenses you will look like a mysterious cat in the dark - your eyes will glow with bright green colour under UV light. In daylight on the other hand, your eyes will have a lovely grassy colour - perfect for all sorts of costumes and themes. These contact lenses are perfect for parties themed with radioactive pollution or superheroes. Try them now and have fun amazing your friends with your crazy looks!